Your nose is the most prominent feature on your face and, obviously, a crucial pathway to breathing. It’s no wonder that cosmetic rhinoplasty (commonly referred to as a “nose job”) is sought by so many people – it can drastically improve your breathing and enhance your looks. For some, cosmetic rhinoplasty is literally a breath of fresh air when it repairs the structure of the nose to improve breathing. According to the American Society of Plastic Surgeons a deviated septum is one of the most common structural problems inside the nose. A deviated septum occurs when the wall of bone and cartilage that separates your left and right nasal cavities is displaced to one side, or crooked. Rhinoplasty can improve the obstructed airway caused by the deviated septum by adjusting (straightening) the nasal cavities to produce better alignment. The result is improved breathing. 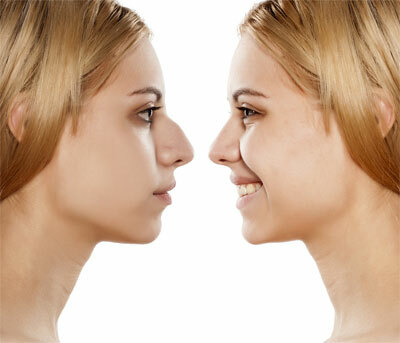 For others, cosmetic rhinoplasty is desired to typically reduce the size or alter the shape of the nose. According to the American Society of Plastic Surgeons, cosmetic rhinoplasty was the 3rd most popular cosmetic procedure in 2015, with more than 218,000 nose reshapings out of 15.9 million cosmetic plastic surgery procedures. The top two most popular procedures were breast augmentations and liposuction, respectively. With a closed rhinoplasty procedure, incisions are made inside the nostril. This type of procedure is commonly used for more minor adjustments to the nasal structures. There is little or no visible scarring after this procedure. A small incision is made under the nasal tip, between the nostrils, during an open rhinoplasty procedure. This approach is usually used for more extensive reshaping of the nose. It allows surgeons greater access to the nasal structures. Any resulting scars are well hidden in the natural contours of the nose. A tiplasty procedure only reshapes the nasal tip without affecting the other nasal structures. An open or closed approach may be used for tiplasty. Check out some of our rhinoplasty work by viewing before and after pictures.